At 5 feet 2 inches tall, Paulina Chaidez may not seem like the most imposing player on the soccer pitch. 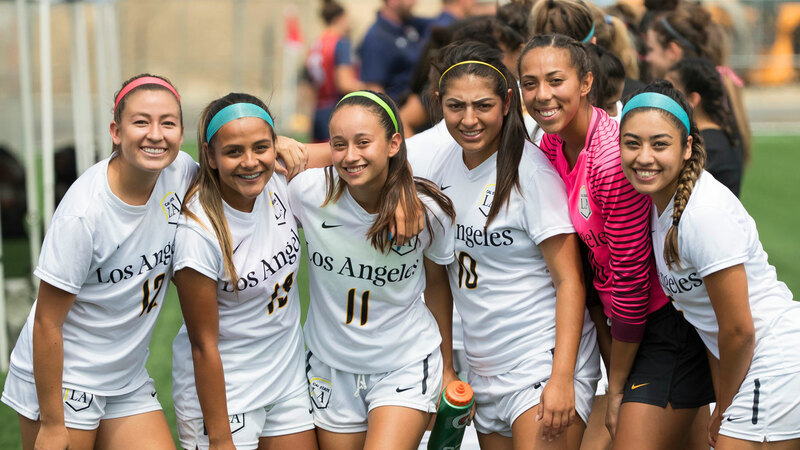 But the first-year striker enjoyed a historic season with the California State University, Los Angeles Golden Eagles. 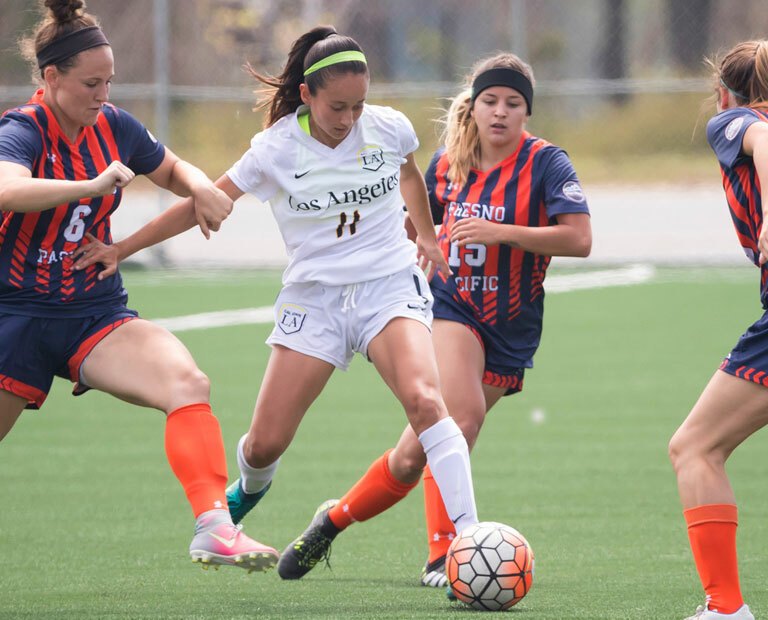 The 19-year-old Chaidez was named the California Collegiate Athletic Association’s Offensive Player of the Year and Freshman of the Year, which are determined by a vote of the conference coaches. She was the first Golden Eagles soccer player to win both major awards in the same season. 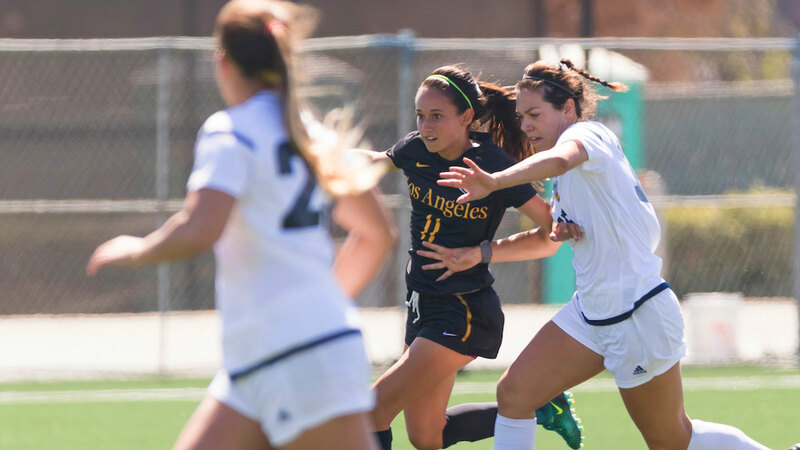 Chaidez led the CCAA in nearly every key individual offensive category in women’s soccer during regular season play. She was first in goals (10), points (25) and game-winning goals (5). Her outstanding season earned Chaidez third-team All-America honors from the Division II Conference Commissioners Association and the United Soccer Coaches. She was also named to both the Division II Conference Commissioners Association and the United Soccer Coaches All-West Region First Teams. She is the first Golden Eagles women’s soccer player to receive these prestigious honors since 2014. “Winning these awards in my first year is something I never expected,” says Chaidez, whose soft touch and powerful strike make her a formidable presence on the field. Chaidez, who hails from Tijuana, Mexico, developed an interest in the sport when she was 7 years old. As she watched a group of boys play, she imagined herself scoring goals and experiencing the excitement. Her school didn’t have a girls’ squad, so she teamed up with the boys. Her love of the game had begun. One of her most memorable experiences in soccer, Chaidez recalls, is taking the field for the first time as a member of the Mexico women’s national team in 2015. She was recruited to play on the country’s U-20 squad three years ago and continues to train and play with the team when she is not competing for the Golden Eagles. 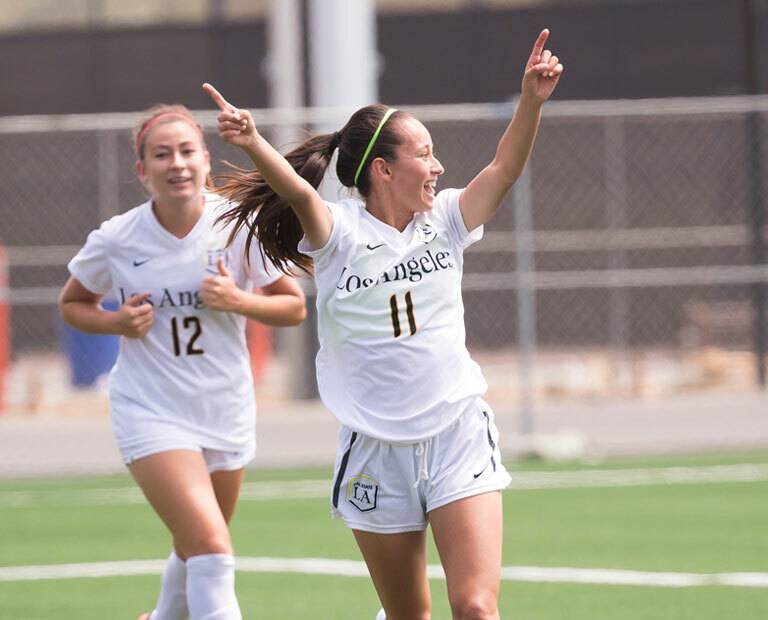 Her biggest moment as a Golden Eagle was in a September match against Fresno Pacific University. Chaidez scored all the goals in the 3-1 victory. It was the first Cal State LA hat trick since 2014. Chaidez also had five assists on her impressive stat sheet this season. For those who don’t know her, Chaidez can seem quiet. Teammates say that’s not the case. Chaidez is motivated by her passion for winning and desire to continuously improve her game. “I want to be better every day,” she says. 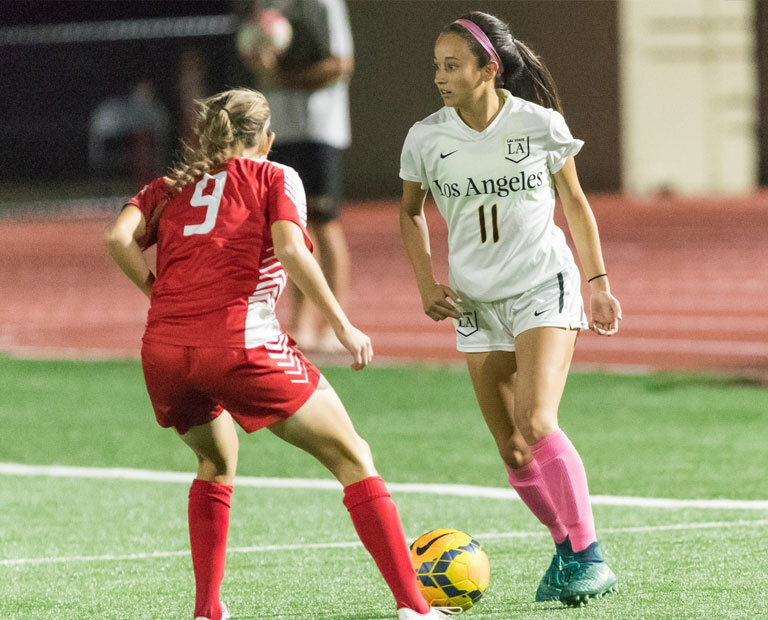 “I’m grateful for all the things that soccer gave me,” Chaidez adds, noting that the sport has provided her the opportunity to play in Los Angeles, where she can pursue her dream of becoming a mechanical engineer. That excitement for mechanical engineering comes from her father. An electrical engineer, he talked to her about the profession while she was growing up and helped fuel her interest in math and physics. 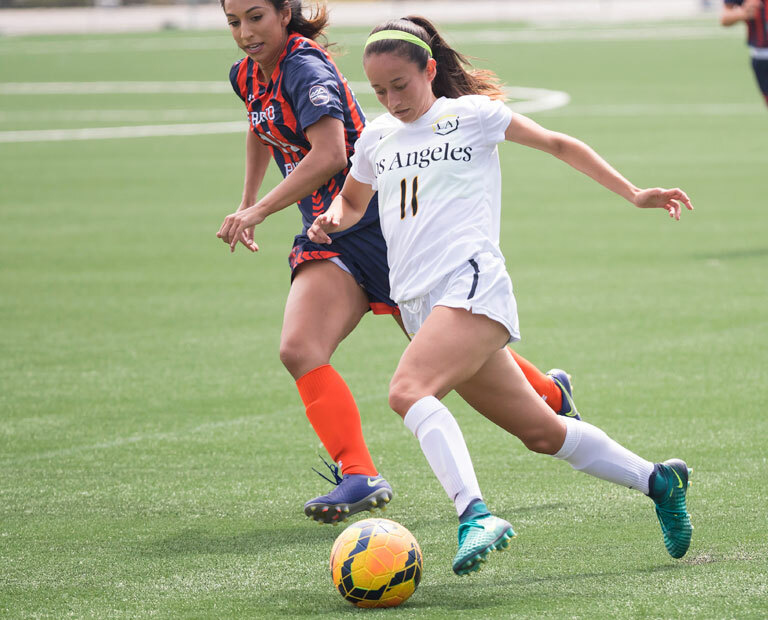 With her first year of collegiate soccer behind her, Chaidez and the rest of the Golden Eagles team look forward to another successful season next fall. Chaidez is expecting to score big in her classes as well. Group photo (from left): Erika Lizarraga, Meranda Salazar, Paulina Chaidez, Zarette Munoz-Aguilar, Adriana Maldonado, and Valerie Mares.